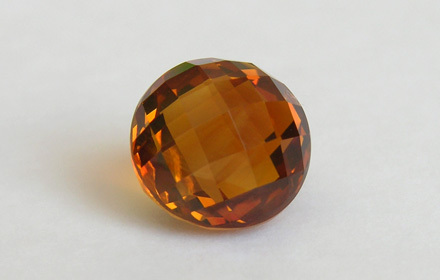 Weight: 2.40 ct; size: 8.12 | 8.12 | 6.47 mm; shape: round; colour: medium reddish orange; strong; clarity: eye clean; cut: fair; treatment: heating. Probably heated amethyst. Very clean specimen; mixed style cut.